The draft for professional sports leagues are hype machines. College-age kids parade in front of media and NFL staff like prized dogs; it's the most public job interview on the planet. While all leagues have something offer fans and athletes, the pure pageantry of the NFL Draft cannot be beat. The event takes place in Radio City Music Hall, the grandest of stages, in the biggest American city "where dreams are made of, there's nothing you can't do" - New York City. These draftees are the nation's focus, some at the peak of their careers: it's their Hollywood moment - there's even a red carpet. These young men will sign contracts that most of us couldn't even fathom, from the dollar signs to the endorsements to the restrictions and ownerships on their lives. It's fitting that companies and stylists are clamouring to dress these future stars before they're whisked from collegiate stars to NFL starters, as the old cliché goes, it truly is the first day of the rest of their lives. In the past, draftees have sometimes come correct, showing their flair or perhaps a swift mother's hand. Other looked like they're wearing old ill-fitting church suits and some were just trying a little too hard to impress. As much I want to see these young men shine, bad draft day outfits are what keep blogs going. But dressing properly for the occasion is something that all new employees of the NFL should learn as it can help them in their public and private reputation for years down the line. If the NFL added a style boot camp to the combine, I would be in sports heaven. One brand decided to try to do their own version of a style boot camp coupled with a strong branding initiative - Sean John. It was announced in Women's Wear Daily, that the man they call Diddy's fashion brand would be dressing a number of top NFL prospects for the draft. Sean Combs' defined his company's work with the draftees as a "pre-draft tailoring experience" where they would be given a fine suit and the use of an in-house tailor and stylist at Sean John's 5th Avenue flagship store. Conversion Sports and Entertainment ran the event which also included a chauffeured Rolls Royce Phantom and a bevy of other goodies. From my last count, the Sean John roster included seven players, all first round draft picks. Diddy didn't get to go number one, but he did get arguably the best player in the draft in Nebraska's Ndamukong Suh who went second overall to the Detroit Lions. Other players included Eric Berry (#5), Russell Okung (#6), Joe Haden (#7), CJ Spiller (#9), Derrick Morgan (#16), Demaryius Thomas (#22) and Dan Williams (#26). This initiative is a great look for Sean John for a number of reasons. They're reaching out to one of the most powerful and flush demographics in the United Sates - professional athletes. These players will be soon cashing in on their talent (and not their universities) and building brand loyalty could really pay off in the long run. Also, this is one of the first occasions for these college players to receive a gift in a public, grand scale without having to worry about jeopardizing their amateur status. Once they declare for the draft, everything is fair game. Sean John swooped in by telling the players that they were rewarding their fine play with a fine suit and showing them a slice of the good life. It's like equating NFL talent with what I'm sure Sean John hopes is NFL style. The other athletes, who perhaps turned down Sean John's invite, see their fellow draftees chauffeured in luxury and catered to by a media mogul may think twice about going to Sean John in the future. 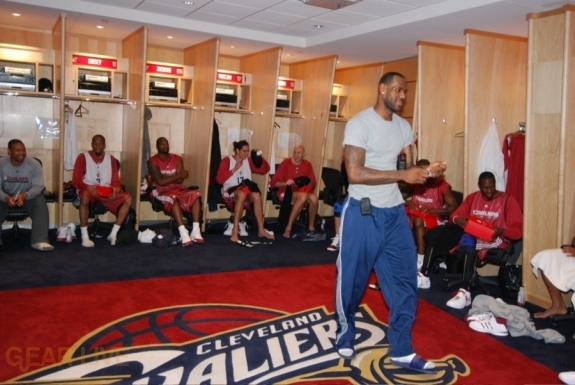 Look at all the Louis Vuitton and Beats by Dre in dressing rooms - could the Sean John suit be the new coveted item? Maybe not, but the attired athletes in their brand will exist in the archives for ages. Down the line, Sean John could also tap into these young men for advertising as using athletes as the model and muse seems to becoming the norm in men's fashion. Cristiano Ronaldo stripped down for Emporio Armani, Tiger Woods was a Tag Heuer man - could Suh be the face of Sean John big and tall? It's not a far-fetched idea. Sean John is doing what their CEO does so well - network to improve his net worth. Diddy would never have come this far without friends and powerful connections - from the Notorious B.I.G. to Anna Wintour, the man makes his Rolodex spin with his connections and hard work. It's only fitting that he models his clothing line with the same work ethic. Sean John also used their blog and Twitter to feature vignettes and behind the scenes photos on the athletes on their Sean John experience. In the age of social media where so many players are taking to Twitter and becoming more accessible than ever, it's fitting to have Sean John let the fans into equation, without even giving them an invite. Some friends who are more sports fans than fashion mavens asked why would these athletes who will soon be making first round money be wearing a brand that is more known downtown than uptown - isn't Sean John a lesser quality product? Although I agree that some of Sean John's suits are not as fashion forward as brands like Z Zegna, Gucci, Louis Vuitton, J. Lindberg, or Dior Homme, but are more standard American sportswear. 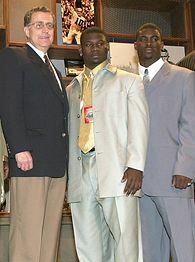 Players that bring size and strength on their frame are not easy to fit into skinny cut suits from a high fashion house even with a tailor's help. Also, like most major fashion brands, Sean John licenses their product to a manufacturer that specializes in suit construction. Peerless Clothing has a factory in Montreal that cranks out 25,000 suits a week for brands like Michael Kors, Calvin Klein, DKNY, Chaps, Ralph Lauren, and of course, Sean John - all New York base brands. When you buy their suits, you're really paying for the name and styling and not their manufacturing and customization. Finally, as a stylist, it's a bit disappointing to see a big company taking over the styling for so many young players who could be potential clients. However, I applaud their use of a tailor on site and suit customization. Buying off the rack will rarely work any man - not just professional athletes. It's worth the time and effort to have a suit to tailored so it fits to perfection than just spending all your money on just a name. Fit is the most important thing to keep in mind while shopping and is accessible at every price and size. Sean John may not offer such luxury to all shoppers, but a personal shopper and a tailor can turn their suit into your suit with a few tips and a little work. And while fashion disasters on draft day are memorable, it's nice to see these young men looking ready for their next big step - the contract and then finally, the playing field. Good luck, young fellas.